So as everyone knows, the translator that blizzard uses is completely inept, and doesn't even show up to translate the GRAND FINAL INTERVIEW? Ridiculous. As usual, after the game Nick was getting ready to do his 2-question post-game interview, but as you can see, they start to freak out as they realize no one is in sight. Panorama and a few other TL guys basically push me up to the stage. One of the Blizz staff members asks me, "Can you translate?" I respond, "Yeah, I can." I had talked to Nick earlier about the possibility of me translating on stage, and I guess he remembered because he helped pull me onto the stage and we were able to successfully conduct the interview! I must admit I was a bit nervous. Although this was not my first interview with a progamer, it was the first one I had conducted with 40 TLers taking pictures with their cameras, multiple video cameras running, and hundreds of spectators. My legs were shaking the entire time, but I tried to keep my voice as steady as possible. The good news is that Blizzard knows that I saved their butts, so hopefully they'll invite me back next time. 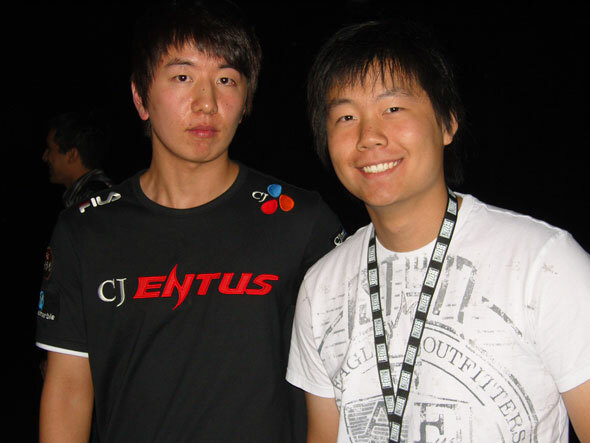 mnm and tasteless both said that they'd see if they could get me to be the official translator. The funniest moment of the night was when some random guy wanted to take a picture with me after the interview. I don't know why someone would want to take a picture with the translator, but whatever, I'll enjoy my 15 minutes of fame! I'm so freaking envious .. photo with NaDa. Hi retsukage @ Pic :p! You did an awesome job translating. The translator was.. really bad and didn't even tell 50% of what the progamers said! I understand how you felt about shaking legs etc, same for me in Paris on stage haha! But you were awesome buddy! 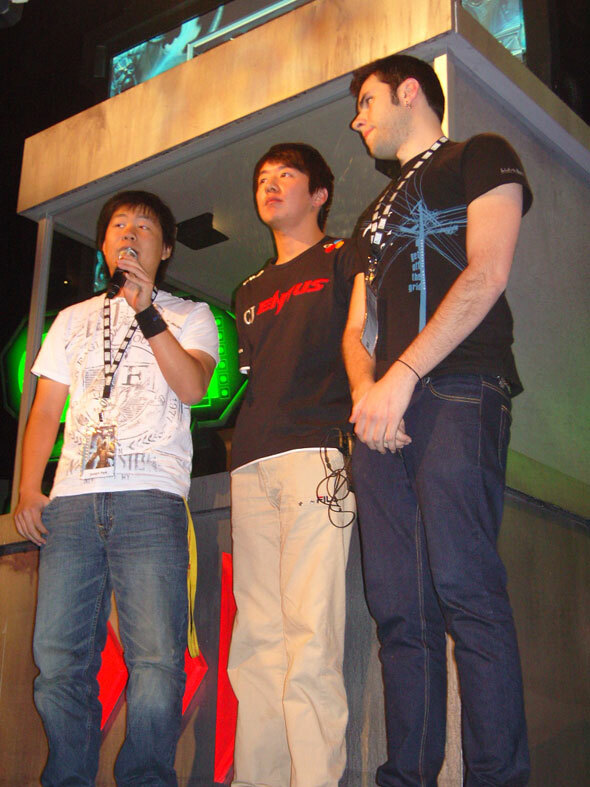 Happy for all who enjoyed the event.. and I'm looking forward to WCG and BWWI / Blizzcon 2009! Good job LosingID8!! ANd omg just look at tasteless face when he realized that there is no translator :D :D :D The Fear!! LosingID8 you are amazing, thanks a lot! Yeah, when I watched it live I didn't notice anything, I only thought "wow the new translator is faaar better". So, really well done sir : ). Totally awesome, when I first saw the video I thought you looked so calm and confident. If you hadn't posted here I wouldn't have known you were nervous. Mad respect for you for stepping up (or being pushed up!). Hope you do get some sort of official translator role, or just get some kind of cool recognition by Blizzard for helping them out in a jam. You did very good, I wouldn't think that you were nervous at all if you didn't say it here :-) I hope that you can get the translation job at future Blizzard events! Yeah I must say you didn't look nervous at all. Great job translating. I recognised you, expected you to be ten times better than the translator hired by Blizzard, but you actually proved to be a hundred times better. Yeah you rock man, I was so happy when I saw that someone competent went up there and did awesome translations! what did savior tell you before the interview? Thats really cool that you got up and translated. You were really professional. I had no idea that you were not a blizzard translator when watching the vod. great job man You saved the day, without you, no epic SaviOr moment. You are an awesome translator. I am so glad you helped us out. Thanks so much for that! Not only were you a much better English speaker than any other translator we attempted, you also calmed me down in my nervous state. Thank you for all your help! I'll try to put in a good word for you too and hopefully Blizzard will call upon you for future endeavors.